You are given a sorted array, A. It contains n - 1 of the numbers from 1 to n. You should find the missing number. You can use the property that for all numbers i less than the missing number you have A[i] == i, while for all i larger than the missing number you have A[i] == i - 1. Design an algorithm to solve the problem and derive its running time. It is fast to add numbers on a computer, but multiplication can be slow. The simple way to multiply two numbers, a × b, is to iteratively add, e.g. If you pick the smallest of the two numbers for the range, the complexity is O(min(alb)). can you derive an algorithm that multilines two numbers in O(log(min(a,b))). 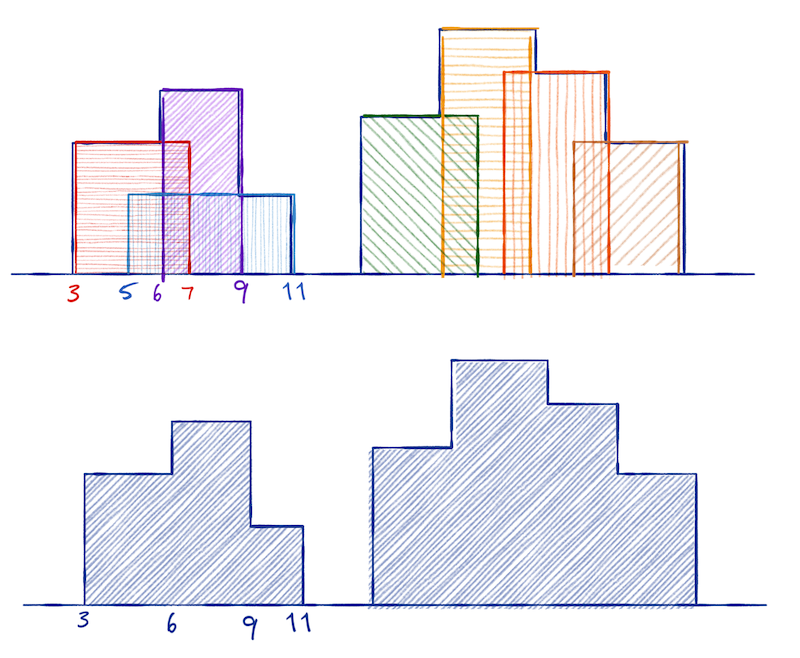 Consider a histogram with splits at integers 0 to n. You want to find the largest-area rectangle in it. You can construct a divide-and-conquer algorithm for solving it by observing that, the largest rectangle contained in the interval i to j (not the one that goes from i to j but the largest inside it) is found in the first half, the last half, or starting before and ending after the midpoint. 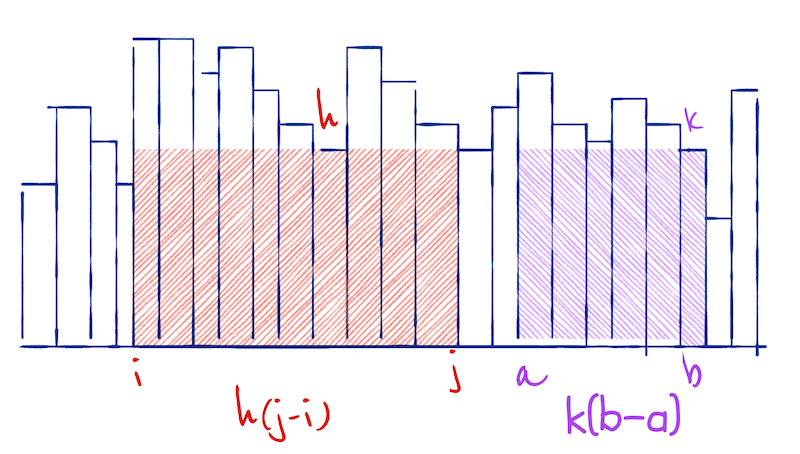 To make the algorithm efficient, you should also observe that you can compute the largest area that cuts through an index m as follows: Compute an array that, for i < m, contains the minimal height between i and m, and that for j > m, contains the minimal height between m and j. If you extend the rectangle around m by moving i from m down to zero and j from m up to n, and you always extend in the direction with the largest height, you can compute the largest area that spans over m in linear time. Construct an algorithm for solving this problem and derive its running time. You are given a list of (2D) houses, represented as triplets (i,h,j) where i and j are the start and end coordinates and h is the height. This list is not sorted. You should compute the skyline of these houses, i.e. a representation of the height of the tallest house at each index i. You shouldn’t represent the skyline like this, but as triplets, (i,h,j), where i and j are points where the height of the tallest house changes and h is the height in the range i to j. The skyline for a single house, (i,h,j), is simply the list (0,0,i); (i,h,j); (j,0,n). If you have two skylines, you can merge them in linear time. Prove item 2. and use it to derive an O(n log n) divide-and-conquer algorithm for computing skyline plots. You can simply do a binary search for the first index where A[i] == i - 1. When you are above this index, A[i] == i - 1 and when you are below A[i] == i so it is trivial to determine which half you should search in at each recursive call. You apply one of the two rules in each recursion, choosing the right one best on whether a is even or not. In each recursive call we halve a so we will reach recursion depth O(log n). Since we only perform constant time operations per level, this gives us an O(log n) algorithm. At each recursive level, you split the interval in half. Then you recursively compute the largest area to the left and the right of the midpoint. You compute the “minimal height” arrays to the left and right of the midpoint and you compute the largest area crossing the midpoint in a merge-like manner. The time recurrence equation is T(n) = 2T(n/2) + O(n) which is in O(n log n). The two skylines are sorted with respect to the indices. Start by setting i to the first index (this will be zero) and h to the first height. Now pick the smallest index in the two skylines to the right of i; call it j, and let k be the the new height at k. If h is less than or equal h, discard this j and move to the next index in the skylines. If k > h, add (i,h,j) to the new skyline, set i = j and h = k and continue the merge.